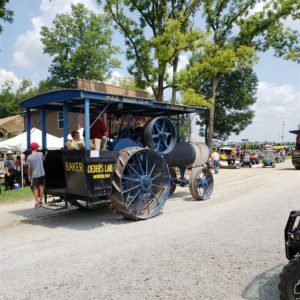 The Pioneer Engineers Club of Indiana held their 70th show at the club’s farm site, just south of Rushville., IN. Farm Jeep was there for three days and for two of those days was the lone Jeep on the grounds. More on that later. This was our first year showing at this event and we will be back. Since the club operates on a working farm (owned by the club) there are demonstrations of all kinds of farm activities from plowing to threshing. A major feature is the 20-30 operating steam engines, that lead the daily hour-long parade of tractors. This year’s featured tractor was the Oliver and there were over a hundred tractors representing that brand. The other 400 or more tractors were spread out among tree-shaded spaces and open fields. One of the many steam engines parading each day. 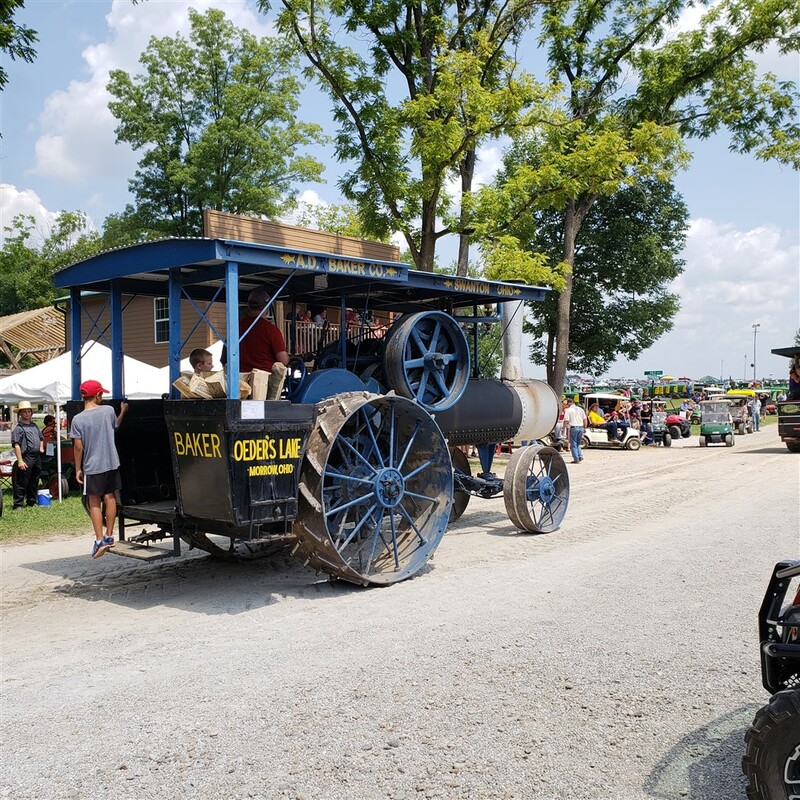 The featured steam engine was the Reeves Pulley Company machine made in Farm Jeep’s home town of Columbus, IN. The steam collection also included a 1921 Stanley Steamer Limo. This beauty could be seen being driven around the grounds several times a day. The noon-time blowing of the steam engines’ “dinner whistle” was preceded by a warning to cover the ears of small children. 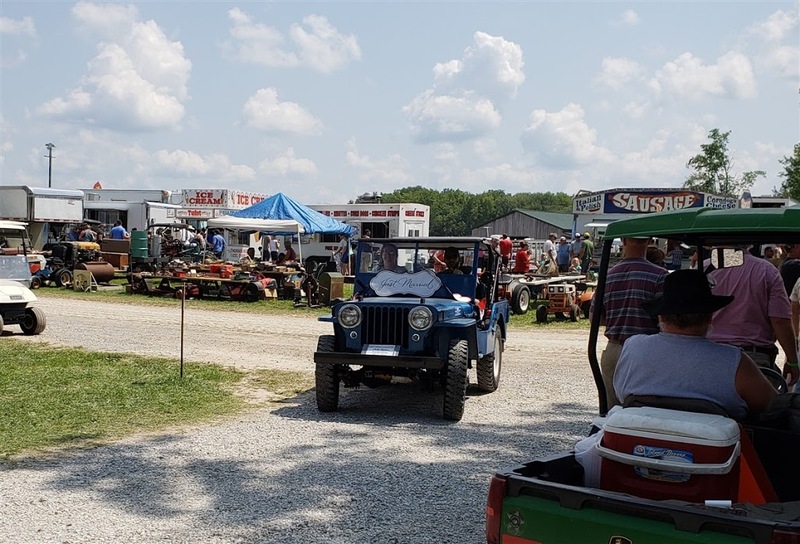 The show has something for everyone, including a couple of Farm Jeeps. 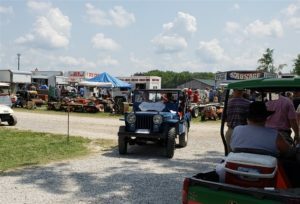 As recently discussed here, tractor shows attract food vendors and this show was no exception. There must have been a dozen food offerings. The Farm Jeep, as always, drew a large number of visitors. We were located near the main buildings and, important for us, near the food vendors. Over the years, we have added informational items to the display that help tell the Farm Jeep story. We recently started carrying our collection of reproduction dealer “special equipment” books. These books list the items that had been tested and “Jeep Approved”. This add-on equipment ranges from hydraulic lifts and implements to industrial welders and air compressors. During the show, we were able to use the books to help identify equipment for owners. 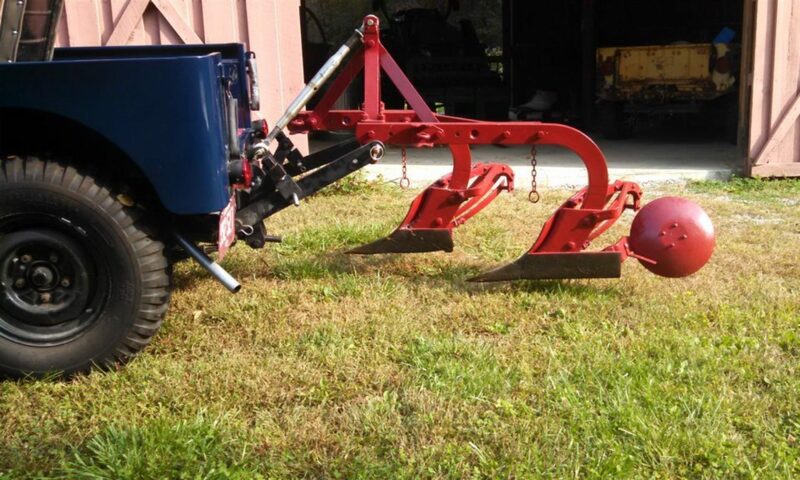 One visitor was a gentleman who said he had a sickle-bar mower for his Jeep that was supposed to be mounted on the driver’s side. We were able to show him the ad for the K&K mower and provide him with some additional information. We hope he will display his Jeep and mower at next year’s show. We heard many fun stories, including another hay baling tale. 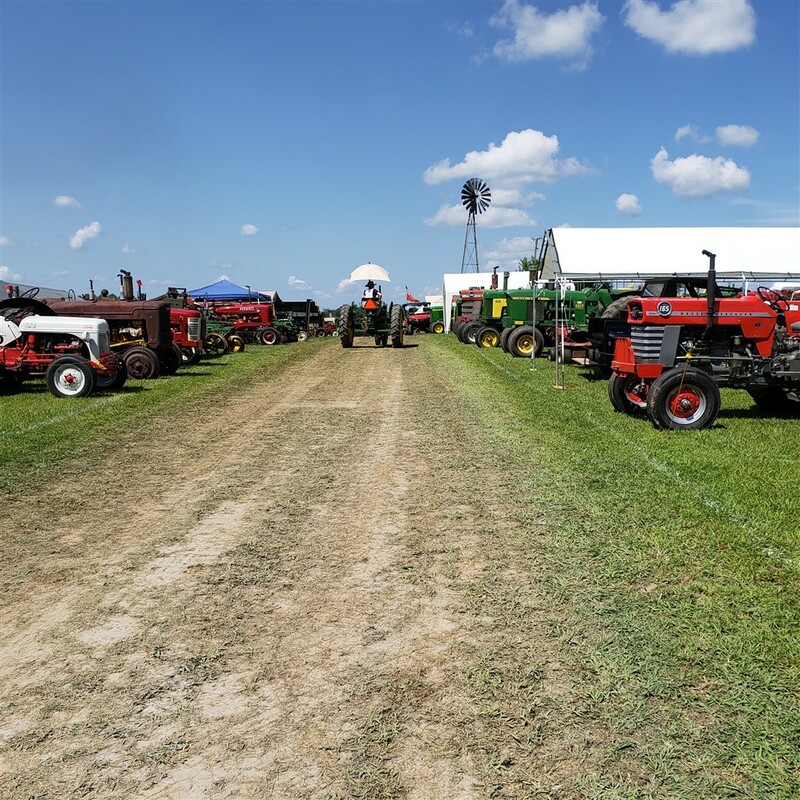 A visitor said his father and uncle had used an International Harvester (IH) baler that was powered by an IH Cub tractor motor and pulled by a Jeep. While the Jeep is long gone, the baler is still in the family and is operational. Since he lived nearby the show, we told him it would be great if he could find a Jeep and display the baler, as an example of one of the most common tasks for the Farm Jeep. It would be fun to add to the number of Farm Jeeps on display. It has always been a dream to be the featured “tractor” at some future show, but we need numbers. 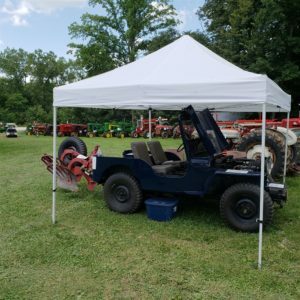 Speaking of more Farm Jeeps, the second Farm Jeep, a 1948 CJ2a with a PTO was there for a very special reason. It had been used to transport the owner’s daughter to her wedding a couple of weeks ago. The new bride and groom wanted to be in the parade. Another great use for a Farm Jeep. Happy couple with a “Just Married” sign leave the parade route – notice the food trucks in the background.